BNP Paribas Open 2011: You're There Right? So have you bought your Indian Wells tickets for 2011? If not may I ask why? Because really, you need to be there. No event has meant more to Tennisplayer over the years than Indian Wells, not only because it is the best venue in the world for filming and data collection, but for all the incredible adventures our team has had there, tennis wise, fine dining wise, and mainly, fun wise. You don't have to look any further than the video above that I did a couple of years ago on the IW experience to see what I am talking about. For our subscribers or any student of the game, and players at all levels, it's a mecca for tennis osmosis. If you are at all familiar with my articles, or learning theory in general, you know that sports learning is a matter of seeing and feeling, not thinking and talking. And there is no better place in the world to see it and feel it than at the Indian Wells Tennis Garden. I'll be writing more next month about the evolution of the this gorgeous facility, including the new high tech features that put it out in front of every tournament in the world. But there is another reason to attend. I personally believe that you support the people that help and support you. If you love Tennisplayer, showing up at Indian Wells is a great way to show that support for an event that has been very important to us in the creation and evolution of our teaching methodologies. Sounds like a tough assignment right? Forcing yourself to attend arguably the most aesthetically pleasing pro event in the world, the fifth slam, with the top players, where you can watch and learn from them at close range, in the gorgeous California desert spring weather. The best players in the best environment. Tennisplayer wants your support! So here is the link for tickets. Click Here. And here is the link for ticket and and hotel packages. Click Here. If you're interested in a package move fast! They selling out. If you want more info about them after you look online, you can call our friend Linda Sullivan directly at Travel and Player Services. 760-200-8434. Tell them John Yandell from Tennisplayer.net sent you! They'll probably be nice! John Yandell is widely acknowledged as one of the leading videographers and students of the modern game of professional tennis. His high speed filming for Advanced Tennis and Tennisplayer have provided new visual resources that have changed the way the game is studied and understood by both players and coaches. He has done personal video analysis for hundreds of high level competitive players, including Justine Henin-Hardenne, Taylor Dent and John McEnroe, among others. In addition to his role as Editor of Tennisplayer he is the author of the critically acclaimed book Visual Tennis. 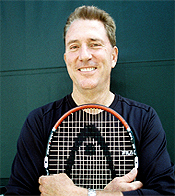 The John Yandell Tennis School is located in San Francisco, California. Copyright Tennisplayer 2005. All Rights Reserved.